Reducing our living costs is on my mind more than ever, as it’s a mere three months until D takes on his new role as a trainee minister. We’ve managed just fine on one income as D’s current IT work pays well, but next year we have quite a drop in salary to wear as a family. We’re cool with that. Quite frankly, if you are making loads of money as a minister, there’s something very wrong going on! But we know that making do on less will take some adjustment for us. We had several options of where D could do his training, and we think we’ve got the place that is the best fit for D, the congregation and for our family. I’m not revealing where we are going until everything is signed on the dotted line, but it’s somewhere very small in the South Island. Two reasons we like the place are that it’s cheap to live there (compared to the other places we were offered), and is small enough to walk or cycle almost everywhere, so we hope to use the car much less. I’d like to think that these two things alone will significantly help us adjust to life on D’s new income. Our food budget is one area that I’m constantly trying to lower as much as possible, which at times feels like a losing battle due to the rising cost of food. I’m not exaggerating: butter has increased in price by 62% (! ), milk by 7.9% and vegetables are up 8.9% since last year. The rise in grocery costs have made me examine the meal plans I create much more carefully. Meal planning saves precious time wondering what on earth to cook for dinner, and stops needless food waste, but it won’t save you money if you choose recipes with expensive ingredients. Meals with lots of meat, dairy or out-of-season vegetables will have you swooning in shock at the cash register (or it could be that your check-out operator is Mr Darcy…ahem, I digress). By being very careful with the recipes I choose and incorporating at least 3-4 meatless dinners a week, I’ve been able to reduce our weekly shop by a 1/3rd, often more. It’s not rocket science, vegetable-based meals are generally much cheaper. If you are struggling to make ends meet and have avowed carnivores in the house, personally I’d give them two options: they can either make more money to pay for their food or they can get with the programme. D and I like most vegetarian meals, which helps us, but there are plenty of delicious meatless meals out there that would please even the most devoted meat-eaters. A modicum of research on the internet brings a plethora of frugal recipes to your browser, and you are sure to find some that get your mouth watering. Here are some of our current favourites. 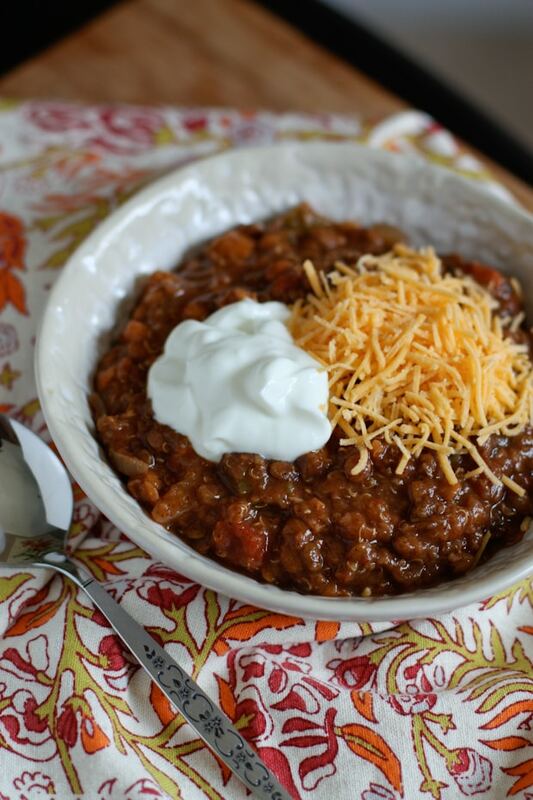 We absolutely love this slow cooker lentil and quinoa chili. In fact, I’d go as far to say as we prefer it to the beef version, am I right D? Quinoa is pricey here in NZ so I just use more lentils. Mmmm, this recipe is delicious, makes a boat-load of chili and is inexpensive. It also takes maybe 5 minutes to prepare, and most of that is opening cans or measuring out stock. 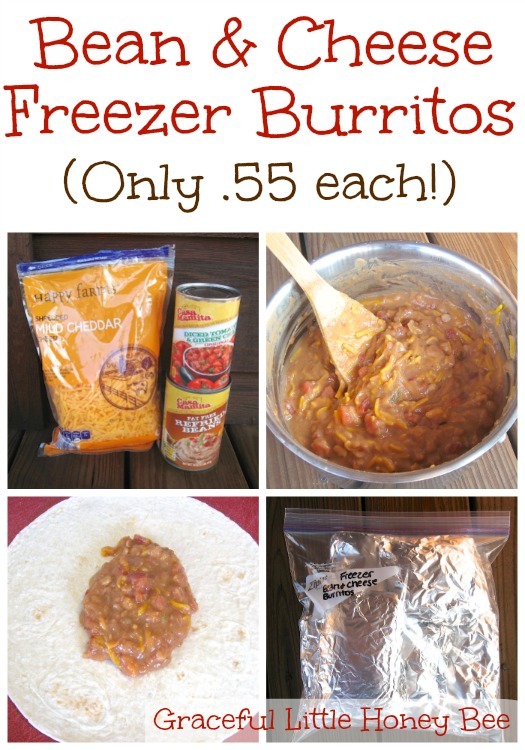 This freezer bean and cheese burrito recipe is terrific. I made 20 burritos which – once frozen – can be popped in the microwave for a quick and easy lunch, or for dinner when I just.cannot.be.arsed.cooking.one.more.thing. I swap out a can of refried beans (more expensive in NZ than the USA, plus just my personal preference) for a can of chili beans, and use a can of plain tomatoes with some burrito spice instead of ‘Rotel’ (an American brand of tomatoes and chillies). I also use a cup less cheese – America, you know I love you, but y’all are obsessed with cheese – and they still tasted great. For my latest batch I used store-bought tortillas. Normally I would make them myself but we had these left over from a weekend of visitors. Even with the added extra of store-bought tortillas, I worked out that my 20 tortillas came in at .77c per tortilla. That’s pretty good! This Corn and Broccoli Rice Casserole needs a bit of tweaking (I use more seasonings and a small sprinkle of cheese) to give it more flavour, but otherwise it is a very frugal and perfectly nice meal. Depending on the price of broccoli or if there’s some in my garden at the time, this dish can be made for $3-4. 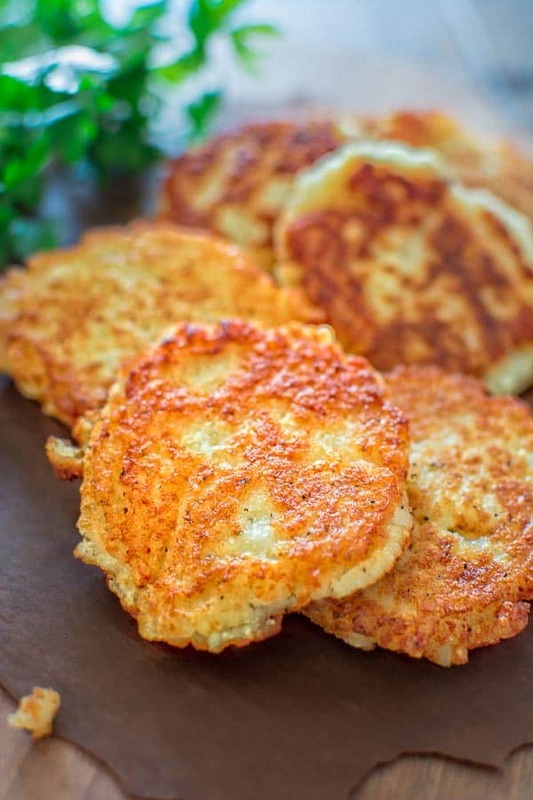 These potato pancakes are very filling with a salad. So there you have it, folks. Do a little research – search particularly for ‘cheap’, ‘frugal’ or ‘depression-era’ recipes, and you will be sure to find recipes that take your fancy. Your bank balance will thank you. Hit me up with links to your favourite frugal recipes! 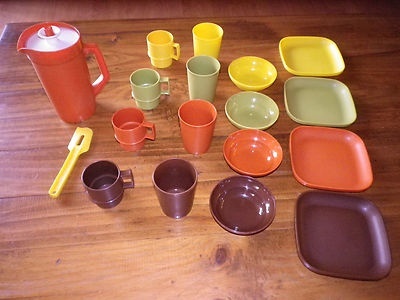 This was not the most frugal week ever as we had not one, but two special occasions. Isn’t that just typical? Nothing much for ages, and then everything happens at once. This year D and I decided to make a special deal out of St Patrick’s Day; and we were also privileged to see two beautiful people get married. I had a great time at both events, enjoying the company of some of the people I love the most. Special occasions can mean you spend more money than usual, but they don’t have to break the bank. Now I have a few kid-free mornings, I have more energy to entertain and to put more effort into celebrations. I think celebrations and traditions are vital for families: they teach a child their family history, culture or religion; traditions help instil a sense of belonging, they help mark the passing of the year, and can bring generations together. D and I are pretty intentional about what cultural or religious events we do or do not observe. For instance, we don’t do Halloween, and Santa, the Easter Bunny and the Tooth Fairy don’t visit our house. But Christmas and Easter are still a big deal, so are Father’s Day, Mother’s Day and birthdays. We also have our own traditions that are special to our family, like our family and whanau nights, breakfast in bed on your birthday, and Gordon ‘sandwiches’ (someone yells ‘Gordon sandwich!’and we all have a group hug). This year we want to mark a few ‘Saint days’. While St Patrick’s Day has largely morphed into a cultural holiday of craic and drinking rather than a religious observance, I am more than happy to mark this day, and for my children to learn about the life of St Patrick, and indeed, about other key figures in Christian history. Make it potluck. This is the norm in New Zealand fortunately! I provided the main dish of Beef and Guinness stew, along with peas, green apple spritzer, and lime jelly. As is often the way, we ended up with a feast. Soda bread, scalloped potatoes, lamb, an all green salad, and several green desserts. Keep decorations simple. I am not an OTT, decorate-anything-that’s-nailed-down sort of person, but I do like to put up a few special things to signify that it’s special event time. I had some green card left over from Christmas cards my kids made, so I made some shamrock bunting. I also found some lovely Irish blessings online, and put them up around the dining table. Some green flowers reduced to clear were the finishing touch. I decorated the children’s table with shamrocks and wrote their names on their place setting (Big hit! Plus I strategically seated my son far, far away from my friend’s son who he likes to pick on, I dislike this phase). The best thing is I can re-use the bunting and blessings in the years to come. Make it meaningful. I spoke one of the blessings over the group as our grace before the meal. After the meal we all sat down to watch the excellent BBC kid’s show Let’s Celebrate. If you aren’t familiar with this show, it follows children as they celebrate cultural and religious holidays (They look at ALL faiths too, which I appreciate). They have a great episode all about St Patrick’s Day which follows two girls in Northern Island as they get ready for the day. Let’s Celebrate always goes into the history and meaning of each event, and this bit is acted out by kids. It’s gorgeous! You can watch the St Patrick’s Day video on YouTube here. It wasn’t only the children who learnt a lot from this episode, many of our guests didn’t know much about St Patrick. Unleash the craic! I don’t think anyone does a party quite like the Irish. To their credit, all our guests played along with my shenanigans. We wores green, played Irish music in the background, D led us on the guitar in old-fashioned sing-a-long, and we played a hilarious ‘Minute to Win It’ game I found on Pinterest, called the Shamrock Shake (which I now can’t find to link to it, sorry). Basically you fill a tissue box with balls (or plastic eggs in my case, which I have for Easter), tie it over your bottom, and shake, shake, shake to see who gets the most eggs out. It was very funny, and even my 2 and a half year old got the gist of it. I’m looking forward to next year already. After our extravagant holiday to Great Barrier Island, D and I recommitted to tightening our wallets. Our holiday was two years in the planning, but even so, holidays have a way of making money slip through your fingers like water. We have some short-term goals, like a possible wedding in Australia to attend (I have my fascinator at the ready, R…), saving for further studies/possibly moving towns, and a long-term goal of, well, just saving as much as we can. Despite a dentist bill, we had a pretty frugal week. I made plum jam, which we enjoyed on pancakes for Shrove Tuesday. Easter is a big deal in our house, and it was a fun way to signal the beginning of Lent with my tots. I keep seeing pancake mix on special at my local supermarket, and throw my hands up in despair that such a product is even required (okay, so my hand-throwing is metaphorical, lest I be known as the crazy supermarket lady). I mean, come on, pancakes are almost as easy as making toast. I went pine cone gathering at a local pine-treed spot for us to use as kindling this winter. The pine cones are an excellent source of fuel for our wood burner, and are absolutely free. For 15 minutes worth of effort (which including scrabbling up a steep bank) I netted two bags of cones. I’ll be going back for more. We packed our lunches and snacks when out and about, and entertainment was our weekly whanau night, and an impromptu BBQ (with the same friends) at the Bason Botanic Gardens which have free gas BBQ’s for the public. I attended my local free gym a.k.a. the great outdoors. At the moment I am relishing my kid-free mornings, and after I’ve dropped Sausage off at kindy I take the top track at Virginia Lake. It takes me 30 minutes and is just like doing a HIIT workout as the track has very steep sections, undulating sections and quite flat sections too. I come home in quite a sweat. I don’t meet a lot of people on the track – which suits me fine as I like peace and quiet when I’m exercising – but I’ve been stunned by the number of elderly people who are on the track too. I hope to be as sprightly when I’m their age! The only downer is my faithful running shoes finally gave up the ghost after long service, and now I have the task of finding some that are actually decent. Quality shoes are so hard to come by! If you have any recommendations, do let me know.